This survey examined actual training hours in psychotherapy modalities as reported by residents, residents’ perceptions of training needs, and residents’ perceptions of the importance of different aspects of psychotherapy training. A brief, voluntary, anonymous, Internet-based survey was developed. All 14 program directors for Accreditation Council for Graduate Medical Education accredited programs in Pennsylvania, New Jersey, and Delaware provided email addresses for current categorical residents. The survey inquired about hours of time spent in various aspects of training, value assigned to aspects of training, residents’ involvement in their own psychotherapy, and overall resident wellness. The survey was e-mailed to 328 residents. Of the 328 residents contacted, 133 (40.5 %) responded. Median reported number of PGY 3 and 4 performed versus perceived ideal hours of supportive therapy, cognitive behavioral therapy (CBT), and psychodynamic therapy did not differ. Answers for clinical time utilizing these modalities ranged from “none or less than 1 h” per month to 20+ h per month. PGY 3 and 4 residents reported a median of “none or less than 1 h” per month performed of interpersonal, dialectical behavior therapy, couples/family/group, and child therapies but preferred more time using these therapies. Residents in all years of training preferred more hours of didactic instruction for all psychotherapies and for medication management. Residents ranked teaching modalities in the following order of importance: supervision, hours of psychotherapy performed, personal psychotherapy, readings, and didactic instruction. Residents engaged in their own psychotherapy were significantly more likely to rank the experiential aspects of psychotherapy training (personal psychotherapy, supervision, and hours performed) higher than residents not in psychotherapy. 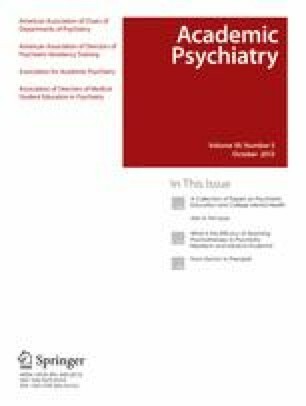 Current psychotherapy training for psychiatry residents is highly variable, but overall, residents want more psychotherapy education than they are receiving. Further research and discussion about how much psychotherapy training is feasible in an evolving field is required. We would like to thank the following program directors for providing resident e-mails: Roy Steinhouse, MD; Anthony Rostain, MD; Richard Summers, MD; Wei Du, MD; Kenneth Certa, MD; Kimberly Best, MD; Gary Swanson, MD; Michael Travis, MD; Imran Trimzi, MD; Consuelo Cagande, MD; Purabi Bharatiya, MD; Najeeb Hussain, MD; Bennett Silver, MD; Barbara Palmeri, MD; and Aftab Kahn, MD. ACGME Program Requirements for Graduate Medical Education in Psychiatry. Effective April 12, 2008. https://www.acgme.org/acgmeweb/Portals/0/PFAssets/ProgramRequirements/400_psychiatry_07012007_u04122008.pdf Accessed Mar 31 2014. The Psychiatry Milestone Project. A Joint Initiative of The Accreditation Council for Graduate Medical Education and The American Board of Psychiatry and Neurology. Nov 2013. https://www.acgme.org/acgmeweb/Portals/0/PDFs/Milestones/PsychiatryMilestones.pdf Accessed Mar 31 2014. Academy of cognitive therapy: candidate handbook. 2013. http://www.academyofct.org/files/documentlibrary/Candidate_Handbook.pdf Accessed Mar 31 2014. Berman E, Heru A, Grunebaum H, et al. Family-oriented care in adult psychiatric residency training. American Association of Directors of Psychiatric Residency Training. http://www.aadprt.org/secure/documents/model_curricula/FAMILY_SYSTEMS_CURRICULA-GAP.pdf Accessed Mar 31 2014.